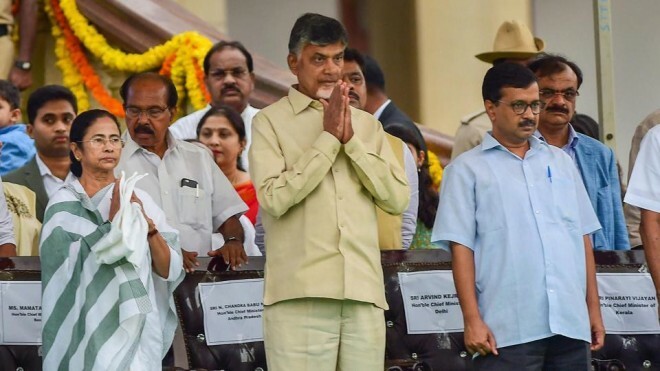 Visakhapatnam, Apr 01: West Bengal Chief Minister Mamata Banerjee and her Delhi counterpart Arvind Kejriwal Sunday rallied behind TDP chief Chandrababu Naidu, seeking another term for him in Andhra Pradesh while also drifting the Modi government for allegedly destroying democratic institutions. At an election rally here, which she described as the launch of her Lok Sabha poll campaign, Banerjee urged the BJP's sister organisations not to support Prime Minister Narendra Modi and his party chief Amit Shah during the national polls. She claimed the BJP won't get a single seat in West Bengal and the party won't cross the 125-mark in the 543-member Lok Sabha. "The BJP has sister organisations. I would like to request them that if you love the country, please don't support Narendra Modi and Amit Shah," the West Bengal chief minister said. "This is a special election. There are not many people to fight for the country, please vote for Chandrababu Naidu. Modi and Shah bully everyone," she alleged. Taking on the PM, she said, "In 2014, Modi got 21 out of 191 seats in Andhra, Karnataka, Kerala, Tamil Nadu, West Bengal and Odisha, that was your best time." "In UP, he got 73 seats when the Samajwadi Party and the BSP fought alone. Now they have come together. In Odisha too, they won't get any seat," she claimed. Banerjee also challenged Modi for an open debate and attacked the prime minister for not addressing any press conference during his tenure. "He reads from tele-prompter and says he has a 56-inch chest." She said Modi is a "chowkidar" for the corrupt. A chowkidar who "lies to people round the clock and steals from them", she said. Banerjee said the country needs a prime minister who doesn't differentiate between Uttar Pradesh and Gujarat, West Bengal and Andhra Pradesh. "Modi said demonetisation would curb terrorism, but it is maximum under his government," she said. Supporting Kejriwal's demand for full statehood for Delhi, Banerjee said the issue needs to be resolved. Kerjwal claimed that Modi and Shah divided India on religious lines in five years, something which Pakistan could not do in seven decades. "Since India's Independence in 1947, Pakistan has been trying to divide India on religious lines. What Pakistan could not do in 70 years, Modi-Shah duo did in five," Kejriwal alleged. "The worst thing they did was to threaten the values India is known for -- unity and brotherhood. They pitted one caste against another and one community versus another," he said. The Delhi CM also alleged that an emergency-like situation was prevailing in the country. "The Modi government unleashed central agencies on our institutions and our people. They (Modi and Shah) have ruined the country in five years. PM Modi led the most corrupt government in the last 70 years," he claimed. Referring to BJP MP Sakshi Maharaj's recent remark that the upcoming Lok Sabha polls will be fought in the name of the country and there will be no elections after that, Kejriwal said, "Hitler changed the constitution of Germany after coming to power and ruled until his death. Modi and Shah would do the same in India. Sakshi Maharaj said there will be no election after 2019." "Shah said at a rally recently that no one can defeat the BJP till 2050 if his party is voted to power in 2019... This means they are thinking on the same lines," he told the gathering, adding, "I appeal to you with folded hands, please remove Modi (from power)." Terming demonetisation "the biggest scam since Independence", Kejriwal alleged, "Modi doesn't have a degree, doesn't have wisdom. He never listens to anyone, only takes advice from Shah, who doesn't know anything about the economy. He announced note ban and ruined the economy." The AAP leader said, "We have come here to appeal to you to vote for Naidu again. He has laid the foundations of a modern Andhra Pradesh. If he gets five years more, he will expedite the process." "Delhi is not a state even after 70 years of Independence. While voting, don't forget that Modi betrayed you (people of Andhra Pradesh) on special status for the state," he said. Later in a tweet in Hindi, Kejriwal said, Naidu and Banerjee have announced they will ensure full statehood for Delhi. Simultaneous polls will be held in Andhra Pradesh on April 11 for 25 Lok Sabha seats and to elect the new 175-member Assembly.